Between a wedding weekend away, a week of working in the Toronto office and a long weekend cottage getaway, it was beginning to feel like I'd been away from home for a while. When I stepped out onto our balcony on Tuesday morning and noticed the size of our basil plant, I knew right away that I'd been gone for too long. Summer getaways are fun and all, but sometimes, all I want is a home-cooked meal and a good night's sleep in my own bed. My Italian girlfriends tell me that an abundance of basil always means pesto, so I took the overgrown plant as a sign. I invited my gluten-free, dairy-free sister over for dinner, and then set out to whip up a pesto that she'd eat -- void of dairy and packed with protein. 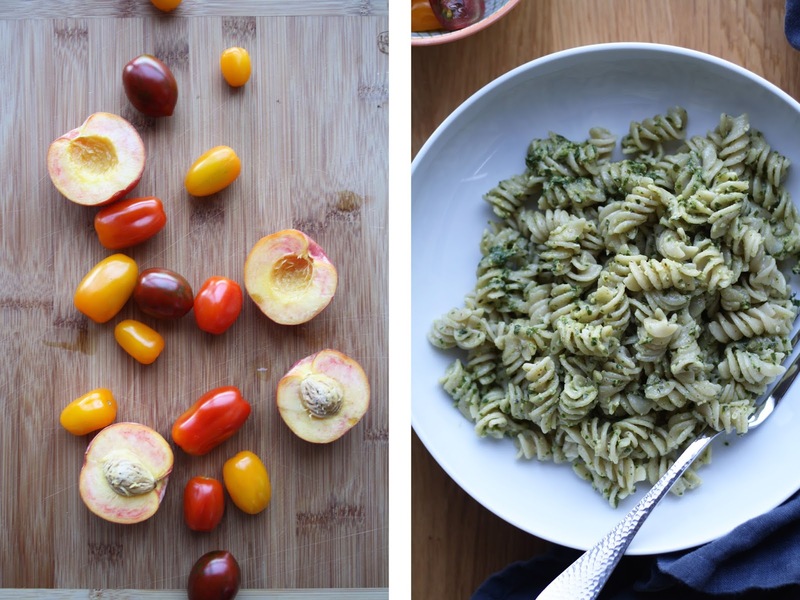 I had a bag of Trader Joe's gluten free pasta that I picked up in Vermont a few weeks back, and swung by the market for some plump quebec tomatoes, and some perfectly sweet ontario peaches -- ideal summer pasta add-ins if you ask me. 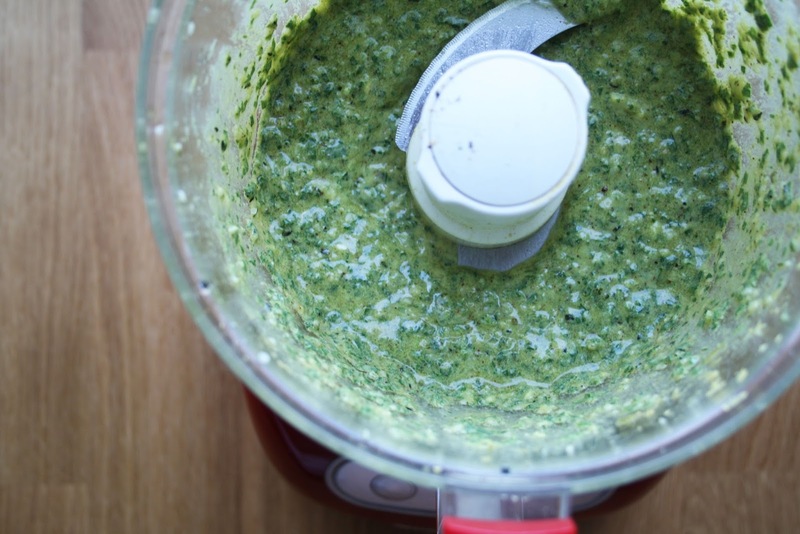 A bit of a bizarre ingredient list for pesto, but trust me, the combo makes for one creamy, though vegan, end result. 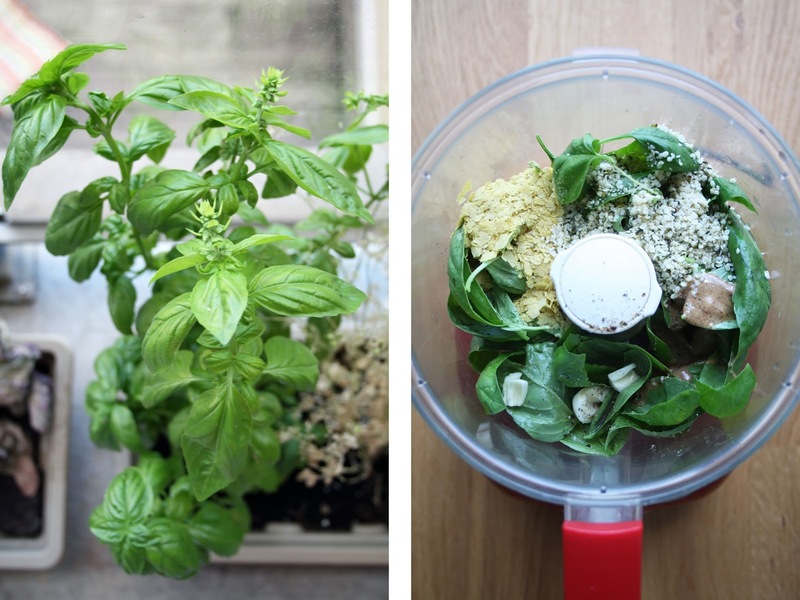 Combine the pesto ingredients, except for the olive oil, in a food processor fitted with the s-blade. Pulse until just combined. Drizzle in the olive oil and pulse until fully incorporated. Cook the pasta as per packaging instructions. 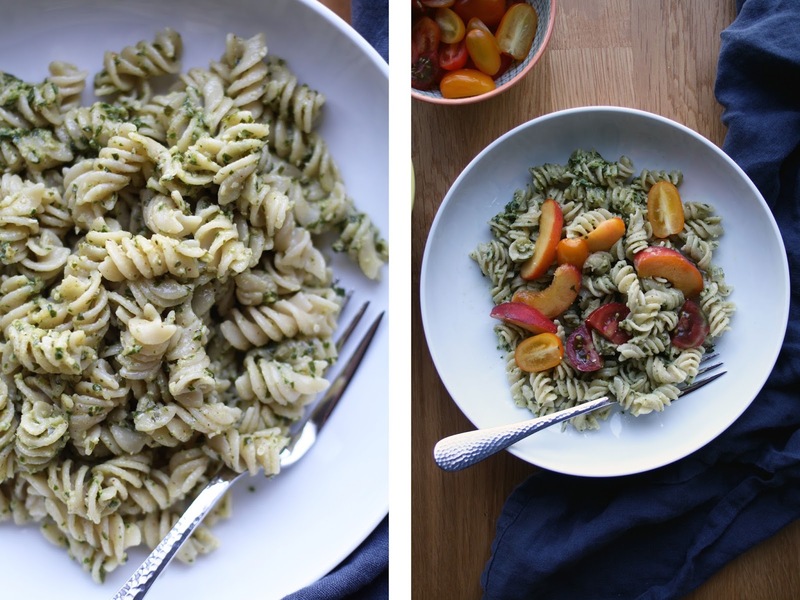 Gently toss the warm pasta with the pesto, and divide among 4 bowls. 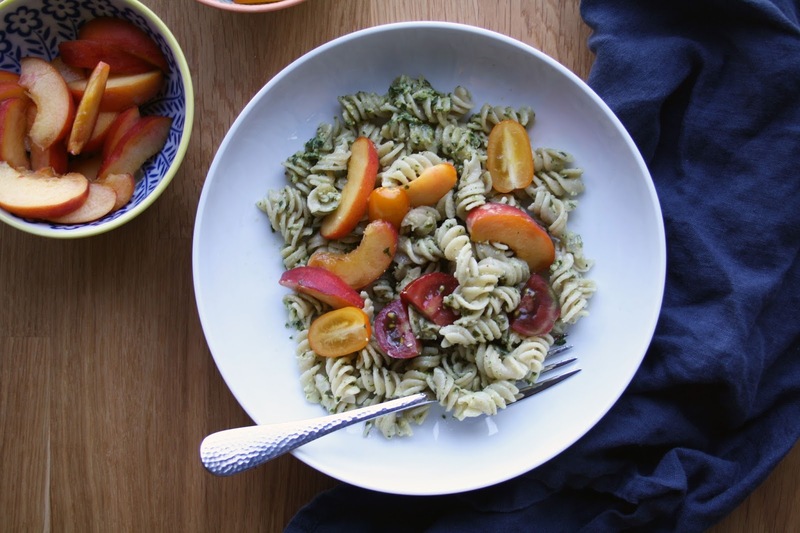 Serve the peaches and tomatoes on the side, for individual add-ins. Alternatively, gently toss everything together before serving. Serve with a fresh crack of pepper and a pinch of salt. *props to the fauxmartha for the genius idea of using almond butter in pesto.